Many of us are probably wondering how December snuck up on us—but here it is! This fun-filled month may bring colder temps, but it also brings the beginning of holiday merriment and offers a time to reflect on all we have to be grateful for. Here at Alvamar, we are thankful for all of our wonderful, long-time members and those members who have joined us recently. As we look forward to 2016, I will remember 2015 fondly. I came to Alvamar in February and have had the pleasure and speaking with many of our membership. I have enjoyed my time and look forward to the coming year with all the prospective changes on the way. 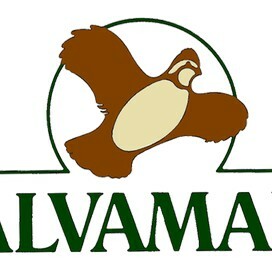 Alvamar is still in the process of doing due diligence for the transition and as soon as we have an update, management will notify the membership. I would like to wish everyone a happy, but most importantly, a safe Holiday Season. for their extraordinary dedication to the club. Christmas on Crossgate will be taking place on December 13th. This year we will ensure that 68 kids receive the blessings of our club. Please look for all the ways we have posted around the club to help donate to the support of this great event. Thanks for your continued support of our great club! Happy Holidays! It was great to see so many members take advantage of the Thanksgiving Day Buffet at Alvamar. We have some fun events coming up. Our Holiday Cheer Brunch with Santa Claus is Dec. 13th. New Year’s Eve is just around the corner and our reservations are filling up fast. Please make your reservation early to guarantee your spot at Alvamar’s biggest party of the year. A special thanks to all of the members who have donated to Alvamar’s Christmas on Crossgate event. This is our annual event when Alvamar invites people in need to the club for brunch and gifts. Each year we share a meal with over 100 people from Lawrence. It’s wonderful to see so many members helping make this event a success. Try this Candy Cane Cocktail at your next holiday party! Do you have leftover turkey? Here is a good use for some of it! Make Mornay by making a cream sauce then melting Swiss cheese in it. Mix turkey, broccoli, and sauce. Top with more Swiss cheese or buttered bread crumbs and heat in oven (to brown topping) to 165 degrees F.
Until next month, Good cooking. Chef Matthew. Our Menu | Call the Club and Press 1 to to place your to-go order for lunch or dinner! On behalf of Paul, Ryan and I, thank you for another wonderful year. During this holiday season things slow down around the shops and it has given me time to reflect on 2015. The early part of the year we received a ton of rain, but with the understanding membership we got through the moving of and canceling of events. In the later part of the season the weather cooperated which meant we got to see a lot of our membership enjoying our facility. The big events went very well, but I always would like to see more participation. All in all, it is been our pleasure to be the Golf Professionals for Alvamar in 2015 and we look forward to another wonderful year in 2016. Holiday sales will be starting up soon. Keep your eyes open for an Eblast and signs to let you know when and where. If you need to order something special and would like it by a certain date we would need to do that very soon. We are wrapping up Golf 2015 and moving on to the pre-season for Golf 2016. In the golf shop of the Championship Course we have sales on about every item that we have. Whether you are looking for gifts for your favorite golfers or a great bargain for yourself we have the goods. There are so many great values on apparel, bags, and equipment that you will need to drop by to check them all out. In addition to the gift of golf goodies you might consider the gift of better golf for your closest golfers. Gift certificates are available from a single coaching session to The Biggest Loser Program or weekly sessions for a year. Go to alvamar.com and the academy tab to see the program offerings for 2016. The Biggest Loser was offered for the first time in 2015 and the results were excellent. Ron Poindexter was the winner with a thirty percent drop in his handicap index. Way to go Ron! Phil Barrett was second and Sidney Sutton was third. Phil and Sidney were separated by less than a percent at about twenty percent drop in each of their handicap indexes. The Biggest Loser was an opportunity for the golfer to work in private sessions with Paul Hooser and attend the Tuesday and Thursday evening practice groups. Maybe you are ready to compete for The Biggest Loser in 2016. On a personal note, thanks to all of you that have congratulated me on making the Golf Digest list for the top instructors in Kansas. For me, there is nothing that compares to being a part of a golfer's game. 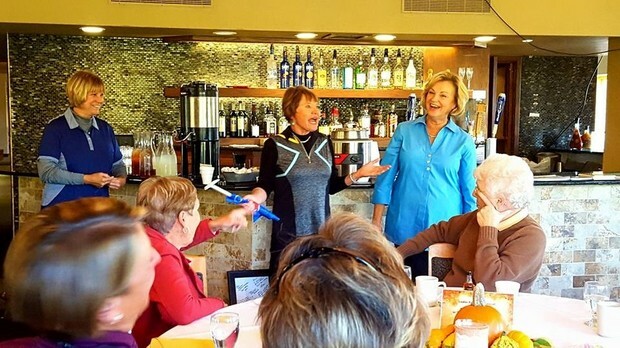 A Farewell Golf outing was held on October 29th for Elaine Brady and Linda Randall. 25 ladies joined in goofy golf, food, beverages and stories told by all. Both of these ladies have been involved with the AWGA for more than 30 years. Their contributions and creative ideas have made the ladies association one of the best in our area. Good luck to them both on their next journey in life. They will be missed. Tuesday Nov. 10th Tom Keegan wrote an article about YOUR AWGA in the Journal World. He wrote about the success of our ladies Team Play event, who have won the gross division four out of the past five years. Kristi Butler is the Team Play Captain. Team Play consists of nine golf clubs in the Kansas area. Look for the really cool trophy on display outside the Pro Shop. The AWGA also participates in KC Cup, and City Play. As Mr. Keegan sates in his article "These Ladies are Champs". Ladies December bridge is on Friday the 11th at 11:30. Please make your reservations by noon Wednesday December 9th by contacting one of the following hostesses: Bebe Huxtable 843-1145 or Jan Maddox 838-8000. As another golfing season comes to a close there are several things the maintenance staff and I are working on. With the shortened staff we are spending much of our time chasing leaves to mulch up and blow away. We are still mowing the greens and roughs, but not every day, and of course we are trimming trees and removing brush to improve course playability. I have heard several members comment on how fast the greens are and they are playing and looking good. There are several things reasons for that. Aerifying the greens made a huge difference. Mother Nature is not pounding us with rain every 2-3 days. Temperatures are a lot cooler which makes the grass not be under stress and produce roots for a healthier plant. The funny thing is we are mowing the greens .030 higher than we do in the, “main playing season”. There are several things that a golf course superintendent can do to help Mother Nature grow grass and maintain grass during stressful times but a grass plant’s life is always much easier when She helps us out. The maintenance staff and I want to thank everyone for their understanding about keeping the carts on the paths. Here is a short article from the U.S.G.A. that helps explain why it is better to keep carts on the path in the winter time if you have zoysia fairways. The maintenance staff and I wish everyone a Happy Holiday Season. We hope the New Year will bring joy, happiness and good health to you and yours. Looking forward to seeing you on the course. CAN ZOYSIA GRASS REALLY SPRING BACK? During a recent week of course visits in the St. Louis area, the obvious signs of cart traffic were evident on zoysia grass fairways, especially when comparing those that receive moderate to heavy golf cart traffic throughout the winter to those that do not. In most cases, it is too early to determine the degree of winterkill or the square footage (and in some cases the acreage) that will require sodding, as the zoysia grass has yet to fully emerge from winter dormancy. While zoysia grass sod is not currently being purchased in large quantities, sod producers are fielding calls from turf managers ensuring its availability, if and when it is needed. Winter cart traffic on zoysia grass fairways is a growing concern among experienced turf managers who have witnessed severe winterkill and who are worried that a potential disaster looms in the future should the northern transition zone experience a severe winter in the coming years. Given the absence of significant turf loss in recent years, golfers and turf managers alike have forgotten the potential for winterkill damage on warm-season turf grasses in this region. Additionally, the younger among us may simply not have experienced a winter in which severe winterkill damage has occurred. Even golf facilities have relaxed winter cart use restrictions over time. Despite this current trend, relaxing the standards on cart use when zoysia grass is dormant is risky. The abbreviated growing seasons for zoysia grass during the last two years have actually further contributed to the potential for severe winterkill in the upper transition zone. More specifically, recent summers have been much cooler than normal and have combined with greater than average rainfall. The overcast skies, when added to the cool and wet soil conditions, have further hampered zoysia grass growth and thus, there really has not been a full season of active growth or recovery. With low mowing heights being maintained late into the golfing season, zoysia grass also is not as durable. A lack of leaf tissue disrupts necessary carbohydrate storage and hardening off that are key plant functions during fall, thereby leaving the zoysia grass in a vulnerable state, as it enters winter. Below are some of the risks and side effects of winter cart traffic on zoysia grass fairways. These may largely be applied to Bermuda grass as well. · Slow spring greenup – Zoysia grass exhibits excellent wear tolerance, but not when it is dormant and unable to recover through growth. As such, the effects of winter traffic accumulate, and this results in a less-than-durable stand of turf that is very slow to green-up in the spring. · Soil compaction – Oftentimes soils are not completely frozen during winter play, and wet soils are easily compacted. Root systems are sacrificed and poor turf health follows. Additional aeration is needed on fairways that receive winter cart traffic. · Weed contamination – Thin areas or wear patterns often develop in high traffic areas and voids in the zoysia grass are quickly established with winter weeds or resident Bermuda grass populations. Winter weeds are fairly easy to control, but Bermuda grass contamination in zoysia grass can be a major, if not expensive, problem. · Large patch (zoysia patch) – Damage from this turf grass disease often lingers for weeks and months where zoysia grass, weakened and stunted from winter cart traffic, is very slow to recover and unable to grow given the damage. · Weakened turf - The biggest pitfalls of winter cart traffic are the season-long weakened state of zoysia grass and the increased potential for future turf loss. As more golf facilities open up their fairways to winter cart traffic, those that do not face increasing pressure and criticism from golfers to do so. Unless this trend is reversed, it is just a matter of time before we learn the lesson…..once again…..the hard way, as basic plant physiology and agronomics have not conquered all that the environment can dish out.